Better a return call when you're ready than a missed call when you aren't. This is a guest post by Graeme Gilovitz. This has to sound like the stupidest idea you have ever heard. How can you get the job if you don't actually talk to someone? Even today, when you can communicate via so many media such as email, SMSes, WhatsApp, LinkedIn, Facebook Messenger and any other applications, the only way to actually get the job is to talk to someone on the phone at some point and then meet them. What makes you more anxious? As a recruiter, we love to catch people off guard because then we get to see (or in this case, hear) the real you and how you behave. Your tone gives us a great insight to your attitude, personality, politeness and professionalism. So when we call and you have no idea who we are, where we are calling from or what role you applied for, you are already on the defensive and the power is with the recruiter. Most likely, you have applied for a few jobs and after a while the calls all sound the same which makes it harder to answer any of their phone questions. It would be funny if it weren't so true. This little conversation is the first stage of the interview process and needs to be treated with as much preparation as a face-to-face interview, even if the call only lasts 5 minutes. Not answering the call gives you time to gather all the relevant information regarding your application, find a quiet place to talk and focus on answering their questions as well as you can. You can’t do any of that when you are taking calls on the fly, especially in a noisy area. So instead of rushing to take the call, call them back. When someone is a too easy to get hold of, it gives the impression that you are sitting by the phone all the time, which translates into “I am desperate for a job”. But if you play a bit hard to get, you can increase your “perceived value”. You can always tell them later that you were in an interview, or a meeting, etc., giving the impression that you must be a valuable potential candidate because other people are already meeting with you (simple logic of supply and demand). Alternatively, just say that you were “unavailable to take the call” – the most universally used excuse ever. What happens if they don't leave a message or you accidentally answer the call? You need to get off the call ASAP no matter what! Ring ring – what are you going to do? Graeme Gilovitz is Director of Summit Resumes and Summit Talent (an Australian-based recruitment agency with an international reach and client base), & has worked in-house with the some of the largest companies in Australia. With a background in advertising and marketing prior to recruitment, Graeme possesses an unique perspective on communication, the recruitment process and how to ensure that you get the most out of your job search. He blogs regularly, focusing on his insights. Subscribe to JobMob via RSS or email and follow me on Twitter to get the most out of mobile video on your job search. Great article Graeme; sound insights and we’ll worth the read. A better prepared candidate leads to better conversation…. Very interesting insight. It seems like people on the employment side of things are playing more and more games. In any case there is always a risk. if you do not pick up on a hot job lead then the recruiter will move to the next candidate and go dark on you. For my it is best to be prepared to take a call when ever possible. I hate to say something is stupid but this is one of the craziest posts I’ve ever read. If it’s not a good time to talk is one thing but not answering the phone because you know it’s a recruiter is loony. Recruiters understand and are always more than willing to schedule a time or call back later but some just doesn’t want to talk (without a good reason) is different.. I almost always ask, “Can you talk?” If someone is running like a scared chicken or not even answering the phone, says more than not being able to have a conversation on the phone. “we love to catch people off guard” Who is this guy? Ask 100 recruiters and I’ll bet you none have ever heard this. When I got into this business (and what I still tell people thinking about getting into the recruiting business) is, people are almost always willing to talk to recruiters. They might say, give me a second (to close their door) but true professionals know the value in having the conversation, with someone who is truly going to help them with their career. Then again, I see Graeme is from Australia. I’ll give him the benefit of the doubt and say maybe they do things differently there. KV is so right! Would you really risk that you would get a second chance? Next conversation delves into how the job fits the individuals background and (more importantly) where the individual is at in their career and what they are looking for. Next call is to close loose ends and make sure the individual is right and interested. When a recruiter calls the individual should be cautious. You need to know who you are working with. I have a lot of candidates say, feel free to send my resume to your customer. THIS is problematic as it shows the individual will probably take anything and also the recruiter is at best average, if they are willing to do this. Good recruiters know the process is about relationship and doing the right thing for both the company hiring (paying customer) and the candidate (their small ‘c’ non-paying customer). 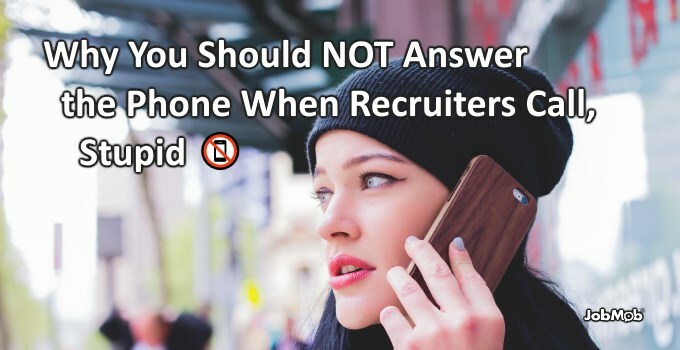 Expecting a call or having to return a recruiter’s call could really trigger your anxiety. Having to shut down that pressure for a moment could be hard, but it will be totally worth it for you as you have the chance for a job opportunity. I remember a time when I was walking along the streets of Toronto and I got the call outside a Starbucks. When I answered I was rushing around trying to find a quiet spot in the middle of a busy street, finger in one year and the phone sandwiched against my ear. Don’t think I made a good impression with all the distractions around me. Needless to say, I didn’t get a callback. I would have been much better off letting that one go off to voice mail. Thanks for sharing Graeme/Jacob. Thanks for your story, Connel. I’m sure a lot of readers will identify with it. None of this is true. In the United States IT recruiting has become so oversaturated that they will call you several times a day. They essentially care nothing more than placing you in a role which is probably going to under-pay you regardless. IT recruiters can help you if you are desperate fpr a jpn but if you are seeking a career or ‘moving up the ladder’ than avoid recruiters at all costs.